This board is intended for breaking out the one wire connectors on our AbioWire hostadapter to standard RJ45 jacks. 4 screw terminals to 4 RJ45 jacks. Can also be used with other bus masters. Jumper configurable one wire ID (DS2401) per RJ45 jack to enable identification of one wire network segments. Jumper configurable 5V supply for the RJ45 jacks. 100 ohm termination resistor for UTP Cat5 cable impedance matching, can be disabled with a solder jumper. 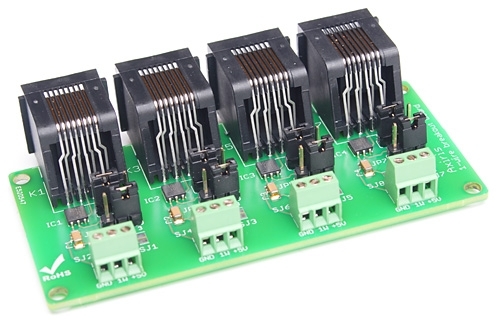 Configurable RC-filter for use with certain one wire bus masters (DS2480B, DS2490B, DS9097). More information about this can be found in the one wire design guide.